After many years of successfully showing hunters, jumpers and driving ponies, Julie opened her first training and boarding facility in 1993 in the Peel & Wellington Regions. Twenty one years later Julie has settled in at Quiet Haven, and offers fun, affordable lessons and boarding for students of all ages and ability levels. Riders who have passed through Quiet Haven Farm will tell you what a great difference Julie has made in their lives, both on and off the horse. 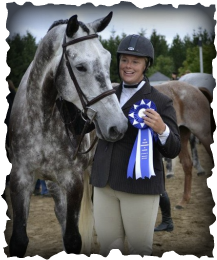 Julie would be happy to discuss your riding and boarding needs and is willing to work within all budgets.